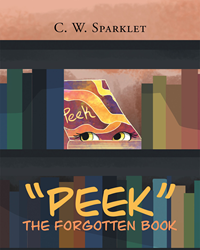 Recent release “‘Peek’ the Forgotten Book” from Page Publishing author C. W. Sparklet is the heartwarming and playful story of a book named Peek who must prove to a new generation that she will never be obsolete. C. W. Sparklet, a retired educator of thirty-three years, has completed her new book “‘Peek’ the Forgotten Book”: a gripping and potent story of a book who finds herself relegated to a dusty shelf as technology comes to predominate the wonderful world of reading. Published by New York City-based Page Publishing, C. W. Sparklet’s amusing tale is an adorable and touching work of children’s fiction. In a world slowly being dominated by eBooks, Peek reminds young readers that the traditional form of reading will always be fun and exciting. “‘Peek’ the Forgotten Book” is a story about a book that feels she is no longer needed. She has now been replaced by technology. She sits and waits on a shelf for a very long time, waiting for someone to pick her up again and open her pages. She waits for two children that think that a book in their hand means nothing anymore when they have a laptop. With a swipe of their finger, a book will appear. As Peek sits, a traveler comes and tells them of his adventures and questions why they are not reading “real” books anymore. The traveler is also the one who has written Peek and has brought them another book, which is also peeking out of his pouch. Peek, the book, is once again important as well as many other books. Only this time, they are used by children, again. Remember, real books don’t need electricity to work. Readers who wish to experience this charming work can purchase“‘Peek’ the Forgotten Book” at bookstores everywhere, or online at the Apple iTunes store, Amazon, Google Play or Barnes and Noble.